SEO efforts are directed towards diverting the web traffic to a particular page. However, often it may so happen that even if you have worked very hard to get the right visitors to your site, they do not stay there for long. This is called the bounce rate of the site. High bounce rate is a very common issue that many sites and there are many things that need to be taken into account before you resign your site’s fate to it. The first thing that you check is the metric that you use for measuring the site’s performance. If you measure your web site in isolation, the bounce rate that they show will definitely be high. It can show the rate to be as high as 40%, but it really does not mean anything. The high rate that is show does not always indicate that your web site is not performing well enough or that you are not able to engage your audience in it. You also need to take into account the average bounce rate of the industry before you determine whether your site is at any risk or not. In some industries the bounce rate is much higher than in others. So what holds true for one industry is not right for the others. 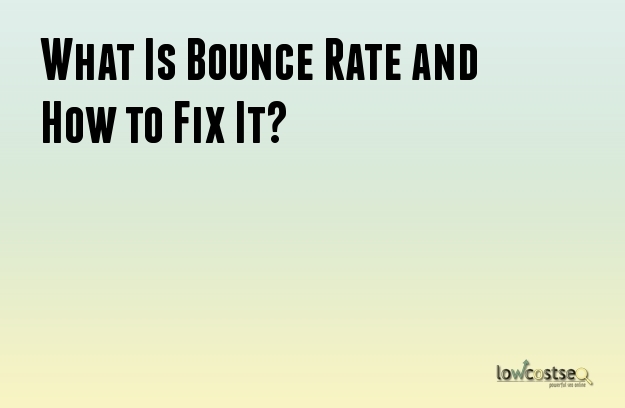 The next thing you need to understand that how your tool is calculating the bounce rate. They are limited in their own way and you have to understand the strategy that they use. You can test another strategy that Google uses called the ‘adjusted bounce rate’. You just need to add one extra line of code to the tracking script of the Google Analytics. This will help in the calculation when the particular internet user has spent certain amount of time in the web page. It is totally based on the type of web site whether the calculation is done based on seconds or minutes. It is up to you to decide the sufficient amount of time that the users need to spend on your web site. Often it happens that customers who are looking for your business number can go to your web page just for it and leave it soon. This can result to high bounce rate. It has been seen that the third party integration can also reflect negatively on the web site’s true bounce results in a similar fashion. If you are using the Google Analytics for tracking the checking your bounce rate, you can introduce the event tracking system for the certain outgoing links. You can use the event tracking or virtual page views in order to track the problem. You also need to check the number of inbound phone calls and include it in the finding to get a truer picture of the situation. Always keep your focus on the big picture and not only on a few statistics. Analyze the bounce rate with other metrics too.